Namikoshi Electronics is a Japanese company in the power industry. They make things such as charge controllers, power meters, and motor controllers that are used in solar and wind generation. They claim that there are two ways to increase engine efficiency. The first is by increasing thermal efficiency when burning fuel and the second is to decrease frictional losses in the engine's moving parts. The Namikoshi engine focuses on the latter. The engine looks similar to an older air-cooled Volkswagen or BMW motorcycle engine with opposed cylinders. However, on this engine, the pistons on opposite sides of the case are actually connected to the same connecting rod and move in opposite directions together (When the piston on the left is at Top Dead Center, the Piston on the right is at Bottom Dead Center). In addition, the pistons in the bottom cylinder are connected to the top so that all the pistons move to the left or right at the same time. In many ways, this engine appears very similar to a Bourke Engine, which has a very similar piston setup and uses a Scotch yoke to convert the linear motion of the pistons into a rotary motion. 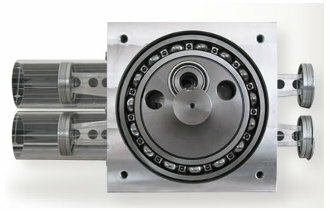 What's different is that the Namikoshi engine uses a huge ball bearing rotary section for the crankshaft engine output. Supposedly, this ball bearing design reduces friction by quite a degree. The overall design of the engine removes many of the friction points of a traditional piston engine (bearings for the crankshaft, connecting rods and piston pins). Another area of improvement is the vibration factor. Due to internal balancing of the piston and balancer movement (they use a sine/cosine relationship between them), vibration is reduced and thus friction is reduced. Namikoshi feels that with fewer moving parts and much less friction and vibration, the engine will be nearly as efficient as a hybrid engine setup. There are a handful of unique piston engines on the market. Whether this one, or any of the others, makes it out of the lab and into the engine compartment of a car remains to be seen.